nah, don't hafta complicate simple things. Art can touch even the creator in "a unique way", so its certainly just a personal phenomena. Everyone reacts differently. LV and I talked about this in google chat many a morning (for me). I apologize if this has been discussed before (I do not remember). Also, to me this is an ongoing question. I come back to it with new thoughts every now and then. 2. Art is that which communicates. With first I must disagree. It is too vague. Art that is art only for its creator may be, but this is not the art I am talking about. I am talking about art which is bidirectional, excuse the word. I am talking about art which other people readily recognize as art. The old old old overused example is music of Bach, the great composer whose music is considered to be art by people who even do not like it. They still feel it is something special. Question is - why? So again, this notion of "I don't care what others think, this is art to me" may be, but this is not the type of art I am talking about. Also, saying that art is a personal phenomena is just trying to simplify a complex question. Everything in our lives is a personal phenomena. Tell me what is not. Even events true for everybody reflect differently in each person's mind. As for what Chris says, this definition, imho, is way too general. I cannot disagree that art does not communicate - it does, no doubt. But lots of things communicate without being art. Are diary entries art? Usually, we do not consider them to be art, even if they are exceptionally well written. My new thought on art is the importance of the perception of skill. It should be there. But, to answer Chris' definition, I would also say that art is not just some generic thing, something good becomes art if it is presented as art. This is a curious point, but the diary example is a very good one to illustrate this. Until now I always thought that would be a problem that only affects us men. Perhaps you've heard of Duchamp? He presented a urinal as art. And - some people could consider a diary art just like a novel can be art. In the Chicago Art museum there are many pieces of furniture and a huge collection of paper weights. For me this definition breaks down when you start considering aboriginal / folk / pop art. 1. How come? Folk requires quite a lot of skill. 2. Even if folk requires much less skill, I guess that it is not the fine arts I am thinking about when I say the word "art". So you see, our discussion already helped me to clarify my own question and perhaps realize that what I am talking often is not just any art, but fine arts. 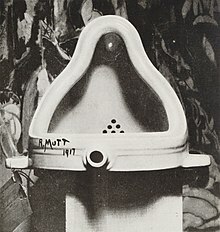 I read about the Duchamp, but I do not consider it to be art. It is clever, even funny, but not more than that.